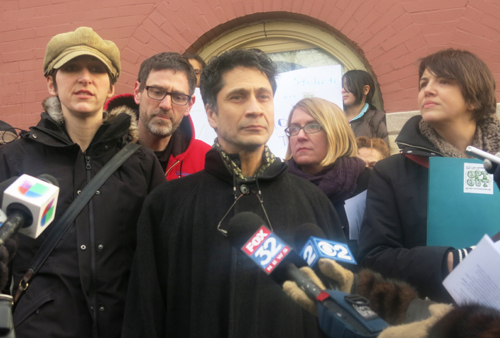 Teachers at Chicago's Drummond Elementary School announced at a February 28, 2014 press conference that they had voted to boycott the ISAT testing program that begins in Chicago's public schools on Monday. At an afternoon press conference in front of the school, the teachers were joined by parents, students, and union officials who support their decision. The Drummond teachers join teachers from Maria Saucedo Elementary School, who voted earlier to boycott the tests. Both Drummond and Saucedo are among the highest ranked CPS elementary schools. Teachers and parents at Chicago's Drummond Elementary School at the February 28 press conference at which they announced that the majority of teachers at Drummond were boycotting the administration of the ISAT tests. Left to right above, Anne Carlson, Jesse Sharkey, Juan Gonzalez, Mary Zerkel, Drummond parent, and Cassie Creswell, a parent leader of the group "More Than A Score." Substance photo by Sharon Schmidt.The teachers were well aware that they may face serious professional consequences by the time they held their press conference. On the morning of February 28, the Chicago Sun-Times ran a story in which CPS "Chief Executive Officer" Barbara Byrd Bennett said that she wanted the teachers to lose their Illinois teaching licenses if they refuse to administer the tests when ordered to do so.